Bogdan Gavrilovie was born in Novi Sad on January 1,1864. Top of the class in his generation, after completing secondary education he was sent by Tekelianum (a Serbian educational institution) to study at the Philosophical Faculty of the University in Budapest, where he obtained doctor's degree in mathematics in 1887. In the same year he was appointed professor at the High School in Belgrade which in 1905 was promoted to the University of Belgrade. He lived in Belgrade until his death in 1947, active as university professor until 1941. He was elected member of the Serbian Academy of Sciences in 1901 and of the Yugoslav Academy of Sciences in 1906. He has great merits for the foundation of Belgrade University and he was elected twice for the rector of the University. On the end of XIX century he had published two voluminous university textbooks which had the character of monographs: Analytical Geometry (1896) on 900 pages, and Theory of Determinants (1899) on linear algebra. 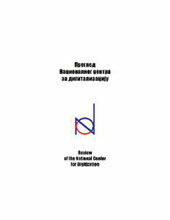 Both works may be considered as capital works in mathematics in Serbia. Academician Radivoj Kašanin thus wrote of the two books: „Both, especially the latter, would do honour to any nation, and many countries, at that time more powerful and luckier than us, could not boast of such works." The aim of this paper is to present the work and life of Bogdan Gavrilović and his digitized books and papers deposited in the Virtual Library of the Faculty of Mathematics in Belgrade. Vladimir Jakšić and Milan Nedeljković are the founders of Serbian meteorology. Many of their co-workers and meteorological observers have contributed to measuring meteorological parameters and recording development of the weather in the nineteenth century. They also described meteorological phenomena by simple words and sentences in some particular days on the margins of the paper. After doing the job, the observers were signed on the pages of record and so their names are preserved from oblivion. These additional observations and recordings represent the valuable contribution to the development of meteorology in Serbia. Former observers had no idea that their records made on pieces of paper become a historical value. In the Virtual Library of the Faculty of Mathematics there are three digitized publications by professor Zaharije Brkić. These publications include his doctoral dissertation, which represents the first dissertation in astronomy that had been defended on Belgrade university. Also, two university textbooks written with prof. Branislav Ševarlić are digitized. In this paper, we give detailed analysis of these works along with explanations of their importance. Cultural heritage is the foundation of a country's culture. The importance of cultural heritage documentation is recognized, and there is a growing need to document and preserve them also digitally. In order to maintain preservation and restoration of certain sights, it is necessary to know all information of such objects. With the progress of modern technologies, there are increasing opportunities for the collection, processing and visualization of objects with national significance. LiDAR technology has emerged as one of the most efficient methods of collecting data nowadays. It offers a fast, high quality and accurate 3D model. LiDAR is a remote sensing method that uses light in the form of a pulsed laser to measure ranges to the Earth. Main aim of this paper is to show how, using this technology, data of objects with significance can be collected and stored in database. Study area is Petrovardin Fortress, which is located in Novi Sad, Autonomous Province of Vojvodina, Serbia. The present fortress was built by Austria from 1692 to 1780. It represents the biggest symbol of Novi Sad. The collected data were obtained in the form of a point cloud. Further processing of data brings a classified point cloud and 3D representation. The 3D vector data that was extracted are stored in 3DCityDB. CityGML is a common information model and XML-based encoding for the representation, storage, and exchange of virtual 3D city and landscape models. CityGML provides a standard model and mechanism for describing 3D objects with respect to their geometry, topology, semantics and appearance, and defines five different levels of detail. The results of this paper are in the LOD 2 level. Museums and other cultural institutions collect newspaper articles about cultural heritage from their domains. Their subjects of interest are articles published in newspapers, periodicals, magazines, etc., in the form of paper, or electronically on the Web. In this paper we would like to present our attitude towards the usability and usefulness of newspaper article contents, the method and software solutions for creating and managing the collection of so far published newspaper articles and software solutions for publishing selected newspaper items on the Museum’s Web site. We are aware that the interest in history, in the past decade, are increased and because of that the archival materials became the basis in researching historical processes. So, the digitized document, which allows the reconstruction of some events, becomes the indispensable part of every specialist’s work who deals with the protection of cultural heritage, scientific research or education of youth. That's why we decided to digitize the documents related to social events in southern Serbia in the eighties of the 19th century. The originals are kept in the Pedagogical Museum in Belgrade in the Fund Djordje S. Kojic. The Fund, among others, also keeps Kojic's letters, written in the eighties of the 19th century. These letters speak about the social events in the newly liberated regions. The analysis of his letters indicates to a gradual transformation of a backward environment which was supported by the educational and political work of the teachers.